A Miami-based startup is building a Tinder for athletic people. 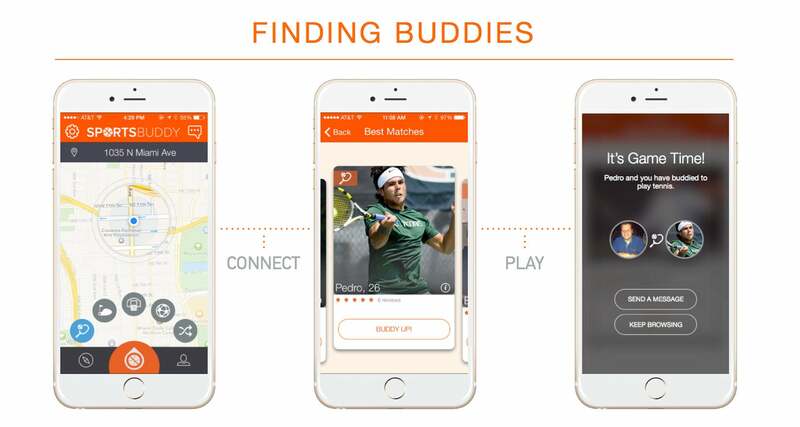 Once you create a profile on the Sportsbuddy app, you pick the sport that you want to play and the “smart matching” technology will suggest potential partners for you to play with who are nearby and at your skill level. You also specify the gender, age and geolocation radius you want to search in. After inviting someone to play, for example, tennis, with you, you can chat within the app to coordinate. After each match, both players rate each other. Sportsbuddy keeps the ratings confidential but uses the information to better match people in the future. Currently, Sportsbuddy has seven sports categories: tennis, golf, soccer, yoga, running, basketball, gym and an "other" option. More categories are on the way, says Mishkin. In Florida, you can also browse through nearby group sports activities you can join or create your own event. An embedded directory of sports venues in the area helps event planners find a location. The event searching and planning features of the app will expand to the San Francisco Bay Area, Los Angeles, New York and Chicago later this summer. The app is free to use, and Sportsbuddy intends to keep it that way. The company has raised a $500,000 seed round so far and plans to seek more. Its plan is to make money by taking a commission from the event venues, instructors or classes that are booked on the platform. It also plans to charge those who want to advertise classes or events on the platform.